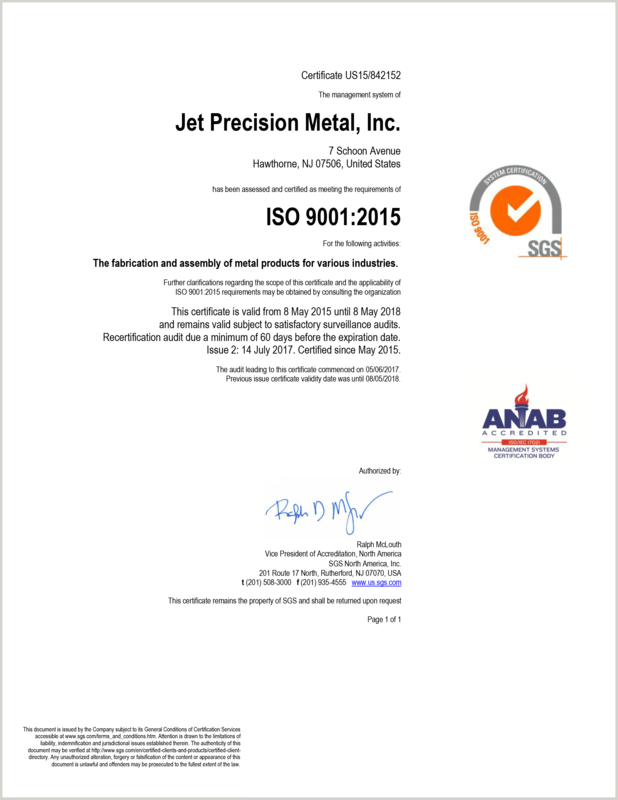 Jet Precision Metal has passed its full audit for ISO 9001:2015 certification. 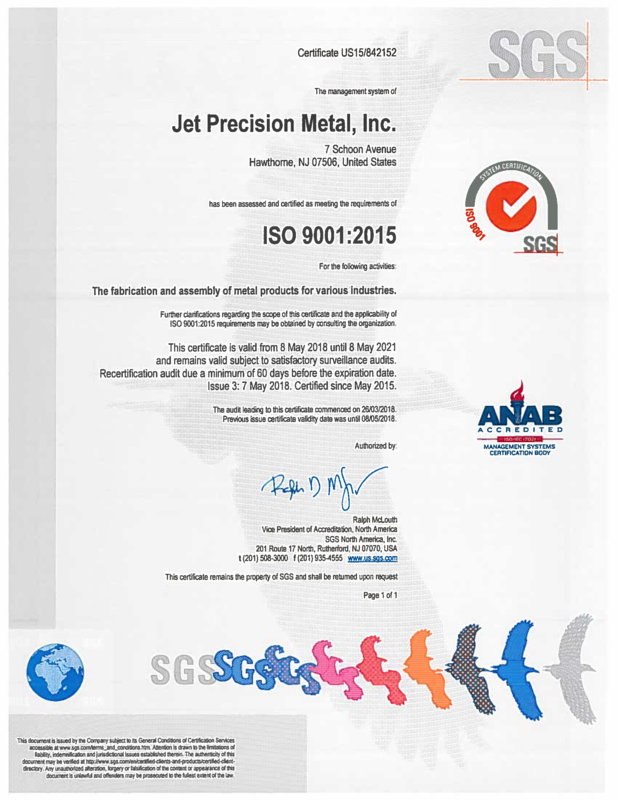 The ISO certification was a renewal of our certification from the previous year and is an affirmation of Jet Precision's commitment to providing quality manufactured parts to our customers just as we have over the past 32 years. Jet Precision Inc. looks forward to continuing to provide quality service and product to our customers. Jet Precision is proud to announce our latest achievement! As of July 25th, 2017 our Quality System received ISO 9001:2015 certification. This marks the most recent milestone in our constant evolution, and was the result of hard work, dedication, and perseverance from the entire Jet Precision team. At Jet we feel that our customers deserve this continuous improvement on our part, as we remain committed to our partnership now and as we move into the future. 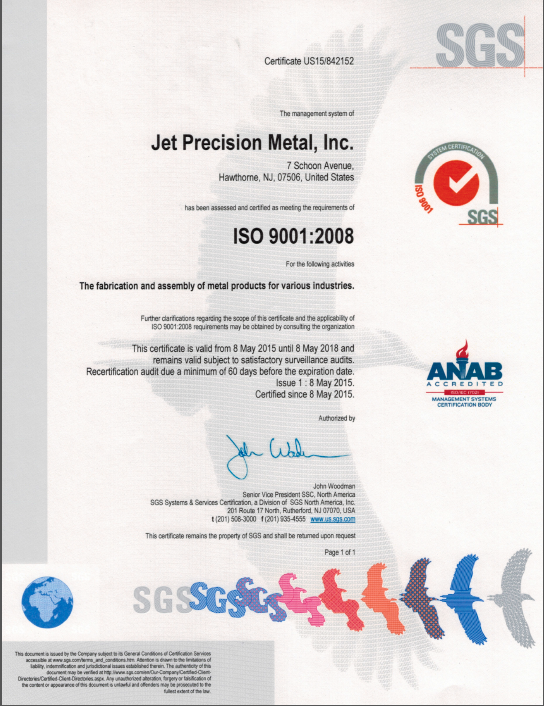 Jet Precision has just completed the less than year-long process for ISO 9001:2008 certification. The process was made easier because Jet has been running its quality program with an ISO based manual and associated processes. Matt Iannucci, Jet Precision’s QA Manager admits that there were some tough times that SGS North America put us through during the ISO certification process but it will be worth it in the long run bringing Jet Precision into the future. Jet Precision has added the HAAS DT-1 Milling Machine to its ever-expanding machining capabilities. The DT-1 is a compact, high-speed drill and tap machine with full milling capabilities. The machine has a 20” x 16" x 15.5” (xyz) work cube and a 26” x 15” T-slot table. A high-speed, 20-pocket tool changer swaps tools quickly, while 2400 ipm rapids and high accelerations combine to shorten cycle times and reduce non-cutting time. The new addition illustrates Jet Precision’s commitment to keeping up with the latest technology in an effort to provide superior service to our customers as we enter our 30th year in business. 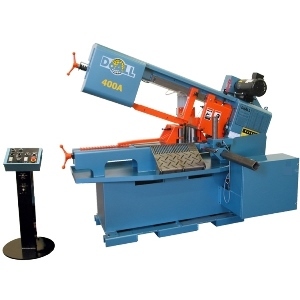 Jet Precision has just taken delivery of the DOALL 400A, a general purpose band saw featuring automatic indexing, pneumatic head lift and hydraulic feed control, the 400A is the ideal machine to make extremely accurate straight cuts in smaller quantities. Featuring a 10” high x 16” wide capacity of rectangles and 10�” rounds at 0 degrees, this machine is equipped with fine adjustment head feed control, gravity roller conveyors and vertical guide rollers. This will make the handling of large extrusions and bar stock more exact and automated for fat throughput. 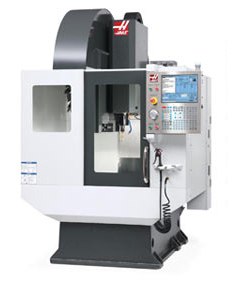 Jet Precision has increased our CNC machining center offerings with the addition of the Haas ST-20 lathe. This CNC lathe will allow Jet to do small intricate parts that were previously not available within our shop machinery. The 12- station bolt-on- turret will allow maximum throughput for long running jobs. Jet Precision has taken delivery of a new LORS 150 AP-DV spot welder to compliment the two spot welders already in service. The new addition will help in Jet Precision’s ever increasing spot welding work centers with new versatility and power. With the increased amount of work we have running through the shop in stainless steel and aluminum the need was very apparent that the addition was definitely a long anticipated requirement. Jet Precision would like to announce the addition of the KNUTH RAPIDMILL 700 CNC machining center. The new machining center holds 10 tools within its turret with a maximum speed of 10,000 RPM and a 157” feed through. The new addition will help with long running jobs that need minimal tool changes. Students at Rutgers University came to Jet Precision to enlist their help in a fabrication project necessary for the successful completion of their mechanical engineering degree. They presented Jet Precision with a concept and detail drawings for the production of a barbecue grill with a unique feature. Their idea was to design and build a grill that would utilize a dual fuel source. The students proposed a grill that would use traditional charcoal briquettes as the main fuel for cooking, but also wanted to use propane fuel to supplement the briquettes. Their idea was to use propane to quickly and easily ignite the charcoal briquettes, at which point the propane could be turned off and the actual cooking would be done over the charcoal, preserving the flavor as well as utilizing the economy of charcoal grilling. Through their collaboration with President Nick DiMaggio and Vice-president Lou Iannucci of Jet Precision Metal the students were able to successfully complete their project. Jet Precision Metal donated their expertise, materials and manufacturing facilities in assisting the students to successful completion of their project at Rutgers University. 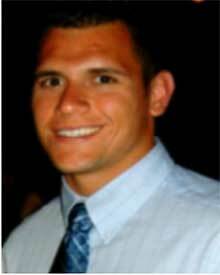 "We greatly appreciate the generous efforts of Nick, Lou, and all the members of Jet Precision Metal. With their outstanding and excellent support, we were able to successfully complete our Senior Design Project at Rutgers University. Thank You!" 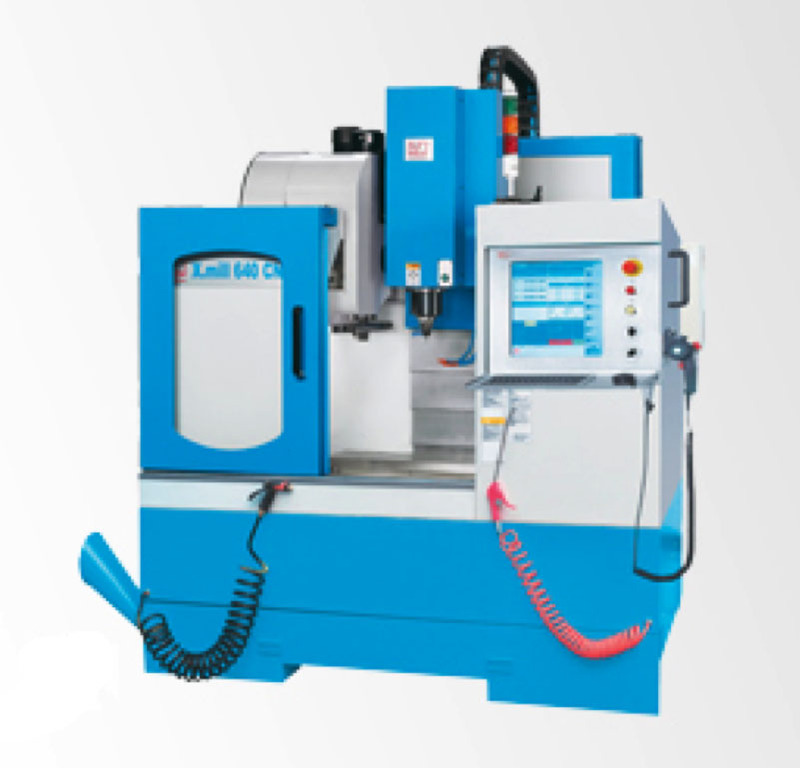 In order to enhance our machining capabilities, Jet Precision has installed a Daewoo DMV3016L Machining Center. This 24 station X-Y-Z axis machine allows Jet Precision to update its machining capabilities, enhancing our serviceability to our customers. Having the Daewoo 3016L in-house expands and increases the processes that Jet Precision can perform in-house for quicker customer product turnaround. - 100” X-axis table processes 8’ sheets of material without repositioning. - Brush table reduces material scratching. Jet Precision has taken delivery an AMADA Vipros 358 King Turret Punch. This workhorse of the Turret Punch machinery world has a 30-ton capacity, 58-station tool bed, auto sheet positioning and a brush bed for reduced parts scratching. Jet Precision has updated its sanding capabilities after taking delivery of a new G & P Stroke Sander. The Stroke sander has a 6” X 264” sanding belt and a table size of 30” X 96”. This allows for the deburring and graining of various types of metal and material sizes with renewed accuracy and consistency that were not achievable before. Jet Precision continually upgrades its equipment in order to provide the best possible service to its customers. For further information please contact Jet Precision directly.